La Paz is intense – in a good way. You can’t help but be blown away before even getting off the bus because you enter the city from above and wind your way down into the massive valley where the heart of the city is located, underneath the shadow of the 21,122 ft. Illimani Volcano. Before you arrive, the guidebooks and a few travelers scare you with stories of complex scams (fake tourist police demanding to see/steal your passport), nasty distractions (someone spilling ketchup or spitting on you and then relieving you of your wallet as you clean yourself up), and corrupt taxi drivers (picking up additional passengers and then “kidnapping” you to an ATM and demanding you remove money). Needless to say, we were a little cautious when we arrived into the craziness that is La Paz. I’m convinced that no one from La Paz would be overwhelmed by downtown Manhattan because the semi-organized chaos of La Paz’s streets and sidewalks would have them more than prepared. You constantly have to watch where you are going so as not to run down an old woman or get hit by a car or step in a hole in the sidewalk. But at the same time you want to look anywhere and everywhere all at once. There are people on the side of the streets selling anything from spices, to children’s bath toys, to toilet seats (which are pathetically underused in this country). There are markets that take up blocks and blocks that include practical items such a clothes as well as a witch’s market where you can buy an alpaca fetus, among other items to bring you luck or others harm. Not only is the city a buzzing and fascinating place, it is surprisingly walkable. We spent several days exploring on foot and could have easily wandered more. We were also looking forward to doing some day trips and trekking in the nearby mountains, but our plans were foiled! One of the most popular day trips to do out of La Paz is to mountain bike the “world’s most dangerous road”. However, when we inquired about the trip in a travel office on our first day in the city, we learn that the access road to both the bike trip and other popular trekking was currently blocked by protesting coca farmers. The government had made an unpopular decision and the result was a road block for an interminable amount of time. Well then! As it turns out, we had several contacts and friends of friends to look up in La Paz. Estefania is our friend who lives in Denver and as she is Bolivian, she has lots of friends and family that live here. She put us in touch with her cousin Ale who was an amazing and generous host. Ted and I got to explore parts of the city that folks don’t always venture off to see and we were even invited to brunch with Ale (and Estefania’s) extended family and friends to celebrate her younger sister’s first communion. 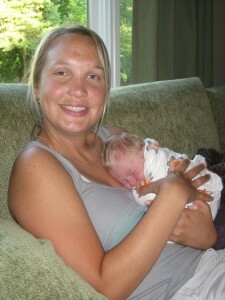 Ale and Estafania’s mom (via helpful emails!) also recommended we go see a pena in the city. Penas feature traditional dances and music from local Andean culture. The performance was vibrant and interactive, with the dancers pulling us up on stage, and musicians playing songs from the home country of each visitor (we got an Elvis tune sung for us). Though there were definitely other tourists there, I was surprised that nearly half was room was people from La Paz who had come to see the show. A huge thanks to Estefania for the introduction, to Ale for taking the time to show us around La Paz and to her family for making us feel welcome! We had a lot of opportunities to conduct trip research in Peru (best job ever!) for our good friends at Adventures Within Reach. The reason there were so many trips to check-out was because our time there coincided with the largest travel industry gathering in Latin America called TravelMart. Buyers and sellers of trips from all over the world, gathered in Lima and to incentivize the buyers (i.e. 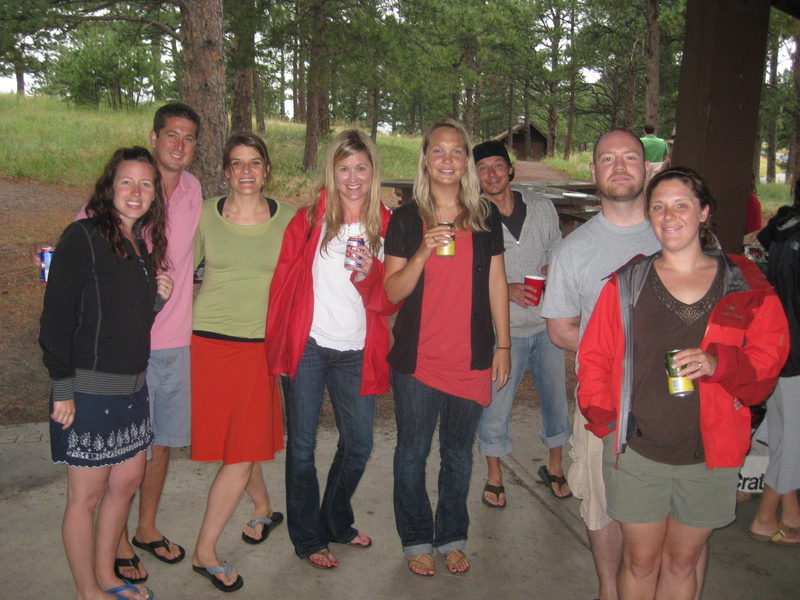 tour operators in North America, such as Adventures Within Reach), sellers (i.e. Mountain Lodges of Peru) offered low to no cost opportunities for people to go on their trips (known as “familiarization” or FAM trips in industry lingo). We were happy to be those people! And another wonderful benefit of the TravelMart being in Lima when we were there meant that we were delivered another cute laptop computer just like the one we had stolen from us in Ecuador! A huge thank you to Mark Lewis in Boulder for doing the on-the-ground shopping to replace our belongings, and an equally big thank you to Barbara and Robin at Adventures Within Reach for schlepping our items all the way from Colorado to Peru. We can’t thank you guys enough! July 14-28: Two weeks in Michigan. 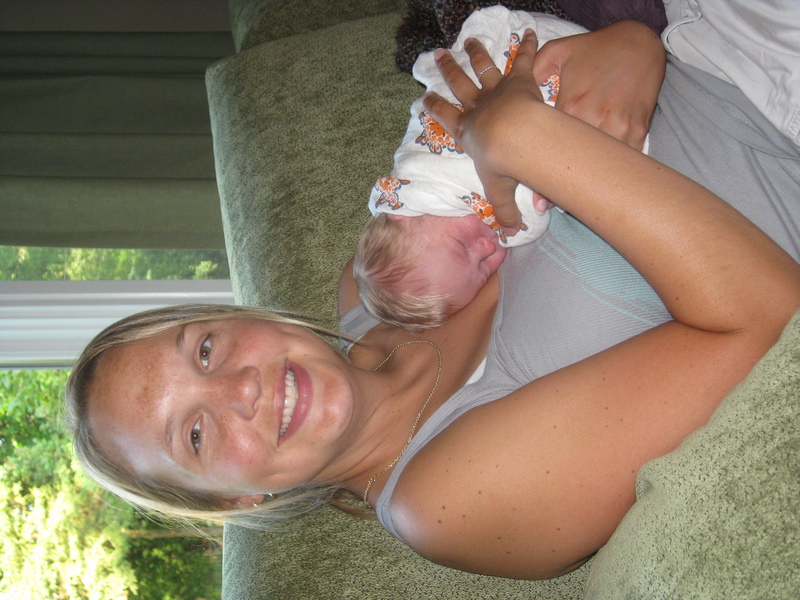 Amazing times – our first nephew is born (welcome Gavin Benjamin Martens! ), quality time with the families in Ann Arbor and northern Michigan, Cottage Weekend, etc. July 29-31: Move out. 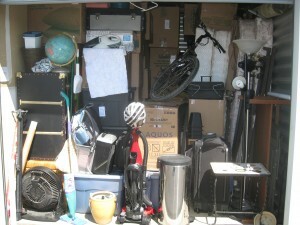 Everything into storage or friends’ basements/garages. Note to self – moving takes longer than you think it will, even with the help of friends and family. Trying to work during moving is also difficult. Aug 3: Last work day for nearly a year! Amazingly good feeling, except that I wasn’t done with work obligations yet (and won’t finish until after week 1 in Ecuador). Aug 4: Work and pack. Work and pack. Tie up loose ends. Aug 5-8 : The world trip begins in Colorado. First, we drive to Durango where we head into the Weminuche Wilderness area for some backpacking in the Chicago Basin. Having not had the opportunity to get into the backcountry at all this summer, we had to squeeze in at least one trip before taking off! This was a special one – the Chicago Basin is one of the most amazing landscapes in all of Colorado, and it’s only accessible by the Durango-Silverton Narrow Gauge Railroad (or by adding an extra day of hiking in). The DSNGR ride is an experience in itself. Operating continuously since 1887, this steam engine used to provide access to the mines in the Weimenuche region. Today, it’s a tourist attraction and super-cool backcountry access vehicle. After a 2.5 hour train ride, we arrived at the trailhead, which led us up to the Chicago Basin over 6 fairly steep miles. The Basin, surrounded by three 14,000ft peaks, was as majestic and picturesque as we had hoped. On day two, we slugged our way to the top of our 4th 14er, Mt. Windom. The unexpected excitement of the trip was our regular and very close interaction with a few families of mountain goats. The Chicago Basin is very highly visited, and the mountain goat population has grown fond of the delicious salty clothing and urine of these frequent visitors. We knew of this issue before arriving, but somehow, we managed to choose the campsite that intersected their daily migration patterns, and they took a liking to us. These guys had no qualms in coming as close as 5 feet from our sitting position, and would occasionally let us know that we were unwelcome guests by marking their territory while looking in our direction. Fortunately, we made it out without incident, and now it makes for a good story. Aug 9-10: Telluride. 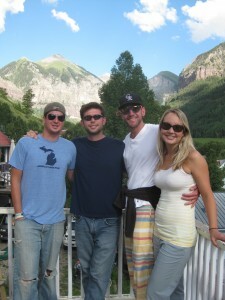 For the 3rd time in 2010, I had the opportunity to visit Colorado’s most picturesque town. This time, it was to see two nights of my favorite band, Phish, and they rocked that box canyon. Joined by great friends in the best live music venue around, it was a killer way to kick off our big adventure. Aug 13: Our final night in Colorado, and one hell of a goodbye party and show. Despite a lengthy break from the previous performance, Zen Mustache members all brought their A-game, and we played a rockin show. Aside from friends and family, I will miss playing music with these guys more than anything else. As many of you know, Ted and I have been dreaming about this trip for a long time. As our savings and planning came together and we realized that we were actually going to be doing this, we were both incredibly excited and amazingly overwhelmed. Though pl ease don’t interpret this as complaining, the last couple weeks in Colorado were some of the most stressful and emotional that I’ve had to deal with in my recent memory. The logistics and planning involved in moving, taking a leave of absence from work, organizing bank accounts, purchasing insurance, and oh, how the list goes on, is certainly complicated. And as family, friends and fun are so important to us, Ted and I juggled our insane To-Do lists with trips to Michigan and SW Colorado as well as happy hours, ‘family dinners’ and concerts with our favorite people. For anyone that saw or hung out with us in the last month or so – thank you! We not only love and appreciate you, but you probably have done or are doing us some sort of favor! For letting us stay at your house after our lease was up; for letting us store anything from musical instruments, a foosball table to a CAR at your home; for helping us move; for letting us borrow a truck; for making us lasagna; for taking us to the airport; for coming out to say goodbye at the Boulder happy hour and Zen Mustache show; for volun teering to drop off our car in SE Parker and encouraging us to stay and have a beer instead; for keeping our mail and bills and life in order while we are away; for picking up extra projects at work in our absence; for your phone calls and hugs and supportive words; for everything I’m failing to mention here but that made our trip a reality – THANK YOU! Those two words do not do justice to the enormous amount of appreciation we have for the people in our lives that we love – but we mean them from the bottom of our hearts and are 100% positive that this trip would not be possible without you.